It seems every day I see an article, post, or tweet about how one can reach Inbox Zero. Well now its my turn, and I do it every day (even multiple times throughout the day) using three simple steps. Using classic Gmail, I have never been able to reach Inbox Zero, however ever since Inbox by Gmail came along, I am able to successfully reach this lofty goal multiple times EVERY SINGLE DAY. It took some time to get my Inbox settings just right so I can accomplish this quickly and easily. Many people use and refer to a formal efficiency process called GTD, or Getting Things Done. However, I am a simple man, and need less formality to reach my goals. I have read GTD as it pertains to email, and it includes obvious steps: Don't spend more that 2 minutes per email, then essentially file the email as to do, wait, or follow up. My technique is, as I mentioned, a bit less formal. But before we get to my process (which honestly will sound pretty obvious once you read it), we should review my Inbox by Gmail setup. When I switched to IbG, I abandoned all of my existing labels in classic Gmail. Thanks to some very effective convincing by +Tom Voute, not only did I stop using all my labels (which had multiple sub labels), I completely deleted all of my labels. I rely 100% on the incredible strength of the search function in Inbox by Gmail and I have never had difficulty finding my emails. Currently I am left with only the system generated bundles, most of which I have set to bundle in the inbox as emails arrive. I have 1 or 2 bundles set to bundle in the inbox once a day at 7:00 AM. I will most likely change this setting for other bundles if IbG ever adds custom bundling times, because for me 7:00 AM is not a great time to see a ton of emails come in. Now, here is what I have been doing consistently to reach Inbox Zero multiple times throughout each day. This is the first step in cleaning out my inbox. I quickly scan through my new messages. With Inbox by Gmail, I can quickly determine whether or not I need to reply to an email just by seeing the subject and who it is from. If it is one that I need to reply to, I draft the reply, and send it off. I don't do anything further other than close the email and it remains in the inbox. 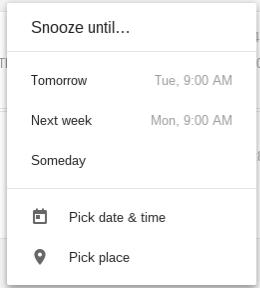 Snoozing is the greatest feature in my opinion that Inbox by Gmail offers, and when employed properly, can be your best tool for reaching inbox zero. As I am scanning through my emails as noted in step 1, I can quickly identify emails that I can put away for later, or snooze. For example, I get reminder emails for bills I have coming up. They usually come anywhere from 15 days to 1 month before the bill is due. I pay my upcoming bills on Sunday, so I snooze all bill reminders to the Sunday Evening that is at least 1 week prior to the bill due day. If I have a project that I need to send something out to someone else, I will snooze the email to the 2 days prior to me needing to send that email. That way it gives me ample time to remember to work on that item before I need to send it out. Other examples include notifications that tell me I have mail at my UPS Store mail box; these I snooze to location so it reappears when I am close to my UPS Store. So Steps 1 and 2 have essentially completed my email work for that session. Since I have scanned through all of my emails to determine which ones qualify for step 1 or 2, the remainder is usually junk, or emails that I just needed to read and not act on. So all that is left in my inbox after step 1 and 2 are emails that I already acted upon and emails that require no action by me. Now all I need to do is Sweep to Done all the remaining emails. And there you have it, Inbox Zero. It's efficient, simple and effective. This is how it works for me, it may not work for everyone out there, but it is simple enough to give it a try.